How and Where to Buy Qvar Online? We carry both brand name Q-var inhaler and its generic equivalent, Beclomethasone, at Canadian Pharmacy World. Place your order for Q-var quickly and easily online at our website: www.CanadianPharmacyWorld.com, click on How To Order or you can give us a call at 1-866-485-7979. Are there Alternative Names for the Brand and Generic Qvar? 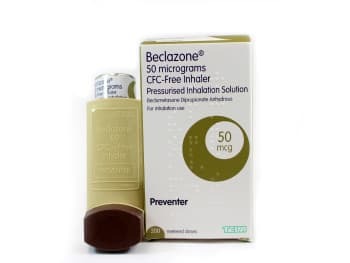 The brand name inhaler manufactured by Valeant is known as Q-var comes from Canada, New Zealand and UK, and its generic equivalent is Beclomethason is known as Beclazone Inhaler manufactured by Teva in New Zealand. We carry both in our online store in several dosages. What Dosages and Forms is Qvar available in? Canadian Pharmacy World carries the Q-var brand in both a 50 mcg/200 metered dose (coming from of the United Kingdom and Canada) and a 100mcg/200 metered dose (coming from of the United Kingdom and/or New Zealand and/or Canada). The generic Beclomethasone inhaler comes in a 50 mcg/200 metered dose, a 100 mcg/200 metered dose (both coming from New Zealand), and a 200 mcg/200 metered dose (coming from India). The Q-var inhaler is a maintenance (or preventative) inhaler for those who suffer from asthma. The medication is an inhaled corticosteroid, which when inhaled into the lungs, helps to decrease inflammation in the airways. Consistent, daily usage may reduce the number of times a rescue inhaler is needed by reducing this inflammation. Note: It is not meant to be used as a rescue inhaler for acute bronchospasm. What are the Possible Side Effects of Qvar? Are there any Precautions and Drug interactions of Qvar? Deaths caused by adrenal insufficiency have occurred in patients who transfer from systemic corticosteroids to inhaled corticosteroids. Patients who have previously been on prednisone (or an equivalent) and maintained a dosage of 20 mg or more per day must talk to their doctor about taking Q-var. Close watch and care is needed when transferring from a systemically active corticosteroid to Q-var. Be sure to talk to your doctor about having a rescue inhaler as part of your asthma treatment. Q-var is not meant to treat acute bronchospasm. Q-var is unlikely to interact with most other medications, but be sure to talk to your doctor about what you’re taking to decide if Q-var is right for you. Store your Q-var inhaler so it rests upside down, on the conclave end of the canister – with the plastic actuator on top. Be sure to store at room temperature, and away from extreme heat. Temperatures above 20ºF may cause the canister to burst. Do not puncture the canister, or throw into a fire or incinerator.